So far, the wrong bodies have been inadvertently exhumed — those of former FBI Deputy Director Andrew McCabe, lawyer Lisa Page, and lover/sleuth Peter Strzok, for example. Clearly, they are not the ones for whom Mueller mounted a full-court press to force a turn-over. 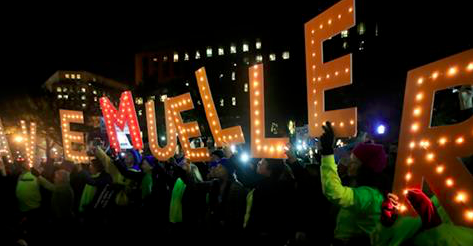 A counter-intuitive Guardian report [[[[[ https://readersupportednews.org/news-section2/318-66/53305-thousands-rally-to-protect-mueller-and-a-historic-victory-for-voting-rights ]]]]] brought to mind relevant reporting in the past on Mueller, under whom former FBI Division Counsel and Special Agent Coleen Rowley worked. She got to know him in an immediate way via his reactions to the two memoranda she wrote directly to him (later made public) about his covering up several still-not-satisfactorily-explained FBI screw-ups that helped make the attacks of 9/11 possible, and about his support for the fraudulent “intelligence” on WMD before the war on Iraq. In a February 2018 article (see link below), Coleen Rowley and Nat Parry found it more than somewhat odd — “nuts,” actually — that “liberals” were going to such inordinate lengths to defend Mueller and his predicate-poor probe.